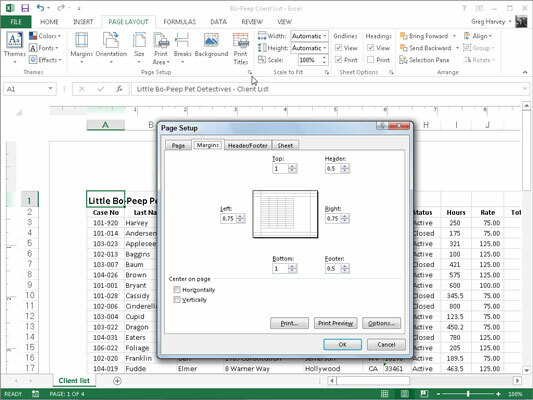 Excel 2013 offers you several options for adjusting the margins when necessary. The Normal margin settings that Excel applies to a new report uses standard top, bottom, left, and right margins of 3/4 inch with just over a 1/4 inch separating the header and footer from the top and bottom margin, respectively. Frequently, you find yourself with a report that takes up a full printed page and then just enough to spill over onto a second, mostly empty, page. To squeeze the last column or the last few rows of the worksheet data onto Page 1, try selecting Narrow on the Margins button’s drop-down menu. 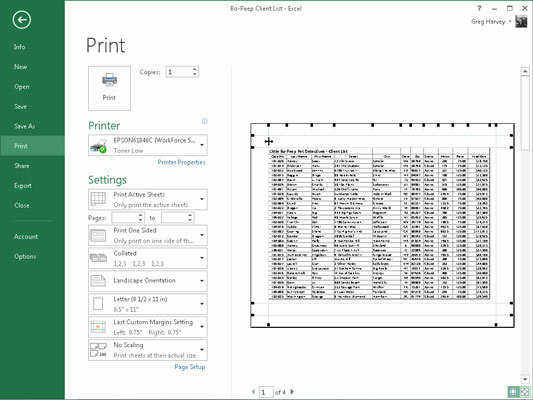 You can try manually adjusting the margins for the report from the Margins tab of the Page Setup dialog box or by dragging the margin markers in the preview area of the Print screen in the Backstage view (Press Ctrl+P and click the Show Margins button). To get more columns on a page, try reducing the left and right margins. To get more rows on a page, try the margins. To open the Margins tab of the Page Setup dialog box, click Custom Margins on the Margins button’s drop-down menu. There, enter the new settings in the Top, Bottom, Left, and Right text boxes — or select the new margin settings with their respective spinner buttons. Select one or both Center on Page options in the Margins tab of the Page Setup dialog box to center a selection of data between the current margin settings. In the Center on Page section, select the Horizontally check box to center the data between the left and right margins. Select the Vertically check box to center the data between the top and bottom margins. When you click the Show Margins button in the Print screen in the Excel Backstage view (Ctrl+P) to modify the margin settings directly, you can also massage the column widths as well as the margins. To change one of the margins, position the mouse pointer on the desired margin marker and drag the marker with your mouse in the appropriate direction. When you release the mouse button, Excel redraws the page, using the new margin setting. You may gain or lose columns or rows, depending on what kind of adjustment you make. Changing the column widths is the same story: Drag the column marker to the left or right to decrease or increase the width of a particular column.